Down in the subbasement/sewer access tunnel of the old church, the Turtles are getting trashed by Slash. Mikey frees Leo from the Evil Turtle’s grip with a blow from his nunchaku, but the monster is virtually invulnerable. Don and Raph rally, but they prove no more effective against Slash than their brothers. On Burnow Island, Baxter Stockman briefly distracts himself from the Technodrome project to get a status update from Chet. Stockman isn’t happy about the specimen’s escape, but Chet assures him that there is nothing that can be traced back to Stockgen. Meanwhile, Krang rallies his Rock Soldier forces. As time draws short, they prepare for an all-out assault on the Neutrino capital of Smada City. At the Second Time Around Shop, Casey decides to skip his big hockey game so that he can accompany April in her search for the Turtles (who are suspiciously late from their trip to the old church). Splinter remains behind in case they come home (and to keep up with his soaps). At the church, Don comes to the grim conclusion that Slash was created by Stockgen for the singular purpose of hunting them down; thus eliminating their option of retreating. He suggests that they have no alternative but to kill their foe. Raph is okay with the idea, but Mikey rejects it instantly, understanding that Slash is not responsible for the things Stockgen did to him. Leo is hesitant about the option, struggling to concoct a non-lethal strategy. Leo attempts to reason with Slash, but the Evil Turtle, in his single-mindedness, is certain that the only way to end his own pain is to kill his prey. April and Casey stumble onto the scene and startle Slash, who leaps onto the unprepared Leonardo. In the scuffle, Leo inadvertently lodges his katana hilt-deep between Slash’s shoulder and plastron. Slash removes the katana and his bandana, stumbles, then collapses into a pool of water leading to the sewer. The next day, April, Casey and Splinter help the Turtles ready their new lair. April asks how Mikey and Leo are taking Slash’s apparent death. Don says that Mikey was pretty badly choked up about it, while Raph says that Leo has been cold and distant since the events. Splinter scolds his sons for underestimating the emotions of their brothers. He says that Mikey’s sensitivity is proof of his empathy for others and appreciation of life. Likewise, Leo’s silent surface is reflective of the inner turmoil he’s feeling for failing to find a better solution to the battle. As Splinter says these words, Mikey finds a note outside the pizza place from Woody. Woody says that he can never hang with Mike again, as the danger that follows him is too much for the pizza guy to handle. He promises to keep the free pizzas coming, though. Mikey sheds a tear at the loss of his friend. Leo, meanwhile, is sitting alone on the lowest level of the lair, staring pensively at his katana and Slash’s discarded bandana. On the shore of the East River, Slash lays unconscious. He’s kicked awake by none other than Old Hob, who wins the Evil Turtle over by claiming to be a hunter just like him. Holding a vile of Splinter’s blood, Hob says that the two of them have a lot of work to do if they’re to get even with those who betrayed them. *This story is continued from TMNT (IDW) #15. The story continues in TMNT Microseries #8: Fugitoid. *Old Hob was shot and left for dead in TMNT (IDW) #12. *This issue also included a floor plan for the new church lair by Kevin Eastman. *This issue was originally published with 3 variant covers: Cover A by Kuhn, Cover B by Eastman and Pattison, and Cover RI by Ross Campbell. The “Blood Brothers” arc concludes, though it acts less as a finale and more a precursor for even bigger events down the line. While some might view Slash’s defeat as a copout, I was relieved that he didn’t bite the dust. Many fans were genuinely concerned that Waltz might eliminate the fan-favorite villain after reintroducing him to the world, myself included. To Waltz’s credit, he made the lingering threat of Slash’s potential demise feel like a genuine possibility and not a surefire false alarm. 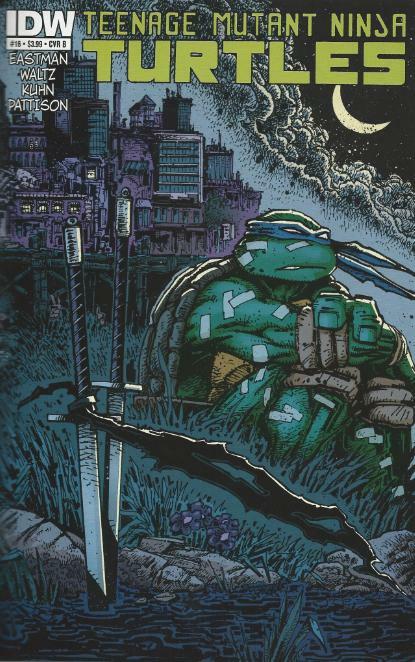 For the past several issues, the concept of killing has been hanging like a dark cloud over the TMNT’s heads; ominously foreshadowing a grim event in their immediate future. SOMEONE was going to die at their hands and Slash was pretty much the only contestant for that inevitability. Furthering the realistic chance of his death was the fact that he, well, knew where the Turtles’ secret lair was, and a villain can’t just walk away after learning something so vital. We end up getting the best of both worlds, so to speak, with the end of this arc. Slash survives his apparent demise, but the Turtles are left believing they did him in and have to suffer the guilt for their actions. While some might feel the development rings a tad hollow, as no one actually died, I’m fine with the way things went down so long as it means Slash is still out there as future foe for the Turtles. We just got the guy back; I don’t think we’re ready to say goodbye again quite so soon. The TMNT’s differing reactions to their perceived “first kill” are interesting; some more than others. Raph being callous toward the whole situation is a given, though Don’s apathy seems a bit perplexing. His being the first one to suggest lethal enforcement seemed even stranger. IDW’s Don has a harder edge than past incarnations; butting heads with Leo and taking a rather unflinching stance in much of his skepticism. But being so quick to suggest killing an enemy displays a rather brutal side of the character that I don’t quite think fits the bill. Yeah, he killed enemy’s like there was no tomorrow in the early issues of Mirage’s TMNT, but that sadistic quality was discarded pretty quickly and Don was shown to be deeply affected by the act of killing even a psychotic terrorist in TMNT (Vol. 1) #12. His decision to kill Slash was based on solid, clinical reasoning (he was programmed to hunt them and he’ll never stop unless they end him), but it runs counter to the character’s established mercifulness and appreciation of life. I suppose making Don a sadsack about killing would have felt “redundant” with Michelangelo, who is shown being emotionally shaken by Slash’s supposed death (and the loss of his friend). That angle certainly fits the character, but I don’t necessarily think it needed to require Don to act differently about the situation. You can have two Turtles that are psychologically injured by the act of killing and not have it read like they’re copying each other. Leo, meanwhile, takes the situation in his own unique way. As the oldest brother and the leader of the clan, he shoulders all of the responsibility for success and failure, or at least he takes it upon himself to. As such, his guilt over being the one to “kill” Slash is doubled by the realization that he failed as a leader to find a better way. As the blandest Turtle, it’s often hard to identify or sympathize with Leo, but in this issue’s epilogue, you get some great insight into his head (with or without Splinter’s stilted exposition). Back on the subject of Slash, I’m curious to see where his arc with Old Hob goes. Old Hob’s appearance at the end suffers from “comic book logic”, as it begs questions such as “how did Hob know where to look for Slash?” and “How did he get that vial of Splinter’s blood?” I figure we’re going to get an answer to the latter, but the former is probably a “don’t think about it” situation. Still, there’s the veiled possibility that Hob will be mutating his own team of mercenaries with that vial of blood, which might mean the return of more classic villains. I’m all for that. 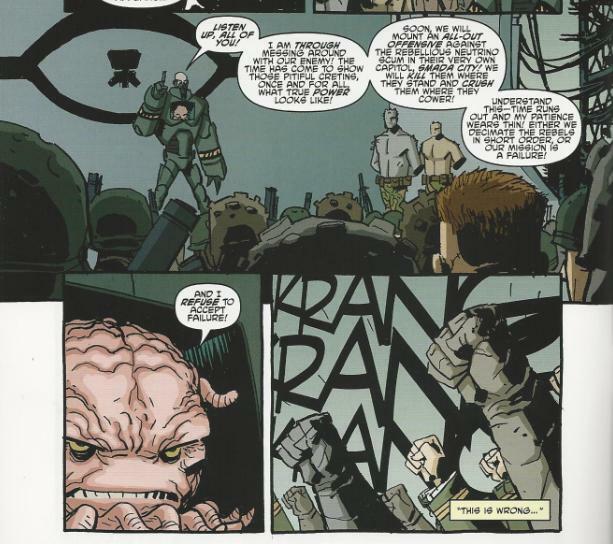 And I’m all for the “Krang War”, which is going to be the next big arc. 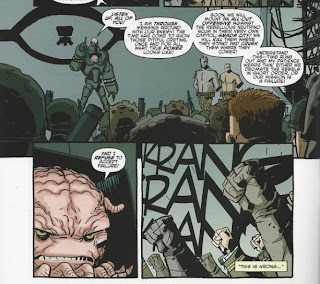 More than the Shredder, more than Slash, more than the Savate Ninja, more than ANYTHING ELSE, it’s Krang’s campaign against the Neutrinos, building since the very first issue, that I have been chomping at the bit over. It’s about friggin’ time. Kuhn steps down from art duties after this issue, with Ben Bates (of Sonic the Hedgehog fame) coming in as the new regular artist starting next month. Kuhn’s run has been divisive amongst fans, to put it politely. 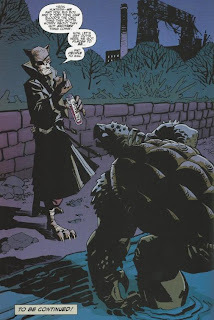 I haven’t felt as vitriolic about his style as a lot of the internet crowd, and I recognized quite a bit of good in it (great layouts and I dug his decision to merge Slash’s and Tokka’s design aesthetics), but there’s always been the matter of his Turtles. It seems the one unifying criticism amongst his detractors was the way he drew their faces, and no matter how good you are at drawing everything else, if you can’t draw the Ninja Turtles in a book about the Ninja Turtles then that’s a deal-breaker. I wish him the best in his future endeavors, and the guy really did draw a bitchin’ Slash, but I’m never the less looking forward to a TMNT book where the Turtles don’t have excessively wrinkly faces and buckteeth. It's interesting how both current incarnations of the Turtles (This series and the Nick show) are FINALLY addressing whether or not the Turtles should use lethal force. It seems like most of the past incarnations went with one extreme (Mirage) or the other (80's toon), without having a character-driven discussion about the ethics of it. Granted, for the 80's toon, that's understandable, and the no-kill policy inadvertently made a stronger origin for Splinter, IMO. But then you get the live-action films and 2003 show, where the issue is notable by its absence. They skipped a good avenue for character development by not delving into the obvious question of why the Turtles never use their big stabby weapons to actually stab things. I was surprised when the 2K3 Leo 'sliced off' Utrom Shredder's head. Sure, we know it was a robot suit, but not at the time. 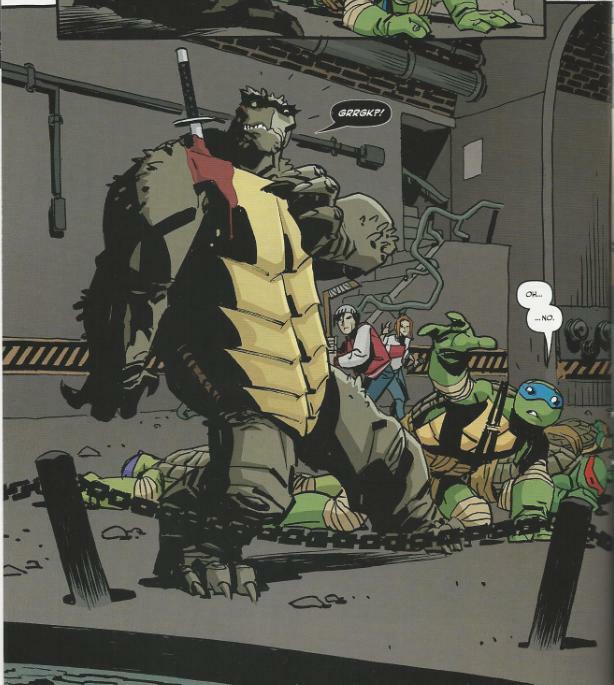 The Turtles for all intents and purposes saw Leo decapitate a man and were fine with it. They just went on home saying 'it's over'. I know that's how Return to New York ended, but in the 4Kids cartoon I'm surprised everyone just shrugged it off like that. Noone said 'dude... you killed the guy'. Even though before and after they would continue to hold up their stabby weapons... and just kick things.